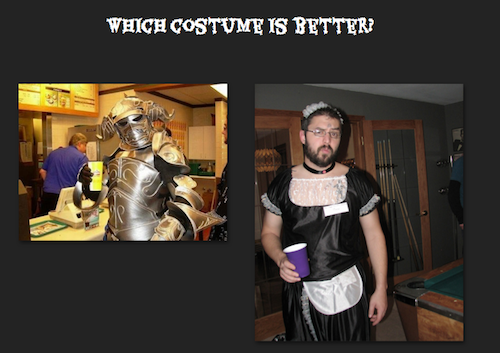 How is it possible no one made a hot-or-not site just for Halloween costumes until now? Sign into Costume Mash with Facebook and either upload your own costume photo or start voting on which of two Halloween costume photos you like better. The percentage of votes your choice received is in the top-right corner. The leaderboard is not finished yet (and we imagine it won't be done before the holiday is over). If you only want to rate the ladies' outfits, be aware that you'll see some cleavage, not quite NSFW but close. Michael Galpert, a co-founder of creative web/mobile toolmaker Aviary and a mentor with TechStars New York, appears to have been involved as well. We've contacted both Michaels for comment.